Earth Day is on April 22, and to celebrate, here are some fun and kid-friendly recipes and crafts! 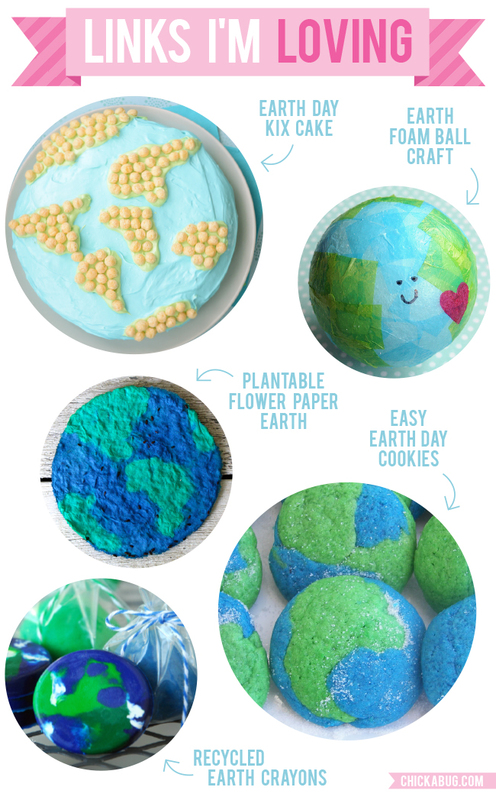 Earth Day cake recipe by Kix – the cake inside is both green and blue, too! Earth Day foam ball craft by Meet The Dubiens – a simple craft project made with a foam ball (preferably reused, of course!) and strips of tissue paper. Plantable paper Earth craft by Modern Parents Messy Kids – make your own seed paper, then you can plant it and watch the flowers grow. Cool! Earth Day cookies by Red Couch Recipes – so easy. So cute. Recycled Earth crayons by The Gunny Sack – melt down leftover green, blue and white crayons to make shiny new Earth crayons! For more fun Earth Day ideas, click here. Also be sure to check out my free printable Earth Day bucket list and this tree planting kit! Earth Day comes right on the heels of Easter this year! Thanks for sharing!